purchasing the 8 Wonders of Kansas Guidebook? June 20 Explorer Adventure, McPherson WILL BE POSTED AROUND APRIL 10. The Big Kansas Road Trip is coming soon to Cheyenne, Sherman and Wallace counties, May 2 - 5, 2019. See the new website now live! Learn more about what it took to produce this one of a kind guidebook. Find guidebook corrections and other updates here. To request a program please contact Marci Penner at marci@kansassampler.org or call 620.585.2374. The Kansas Sampler Foundation is a public non-profit 501(C)(3) organization. Our mission is to preserve and sustain rural culture by educating Kansans about Kansas and networking and supporting rural communities. The goal is to keep every town viable that shows the will and spirit to help itself. Please support us as you can. The Big Kansas Road Trip annually provides showcase counties an opportunity to provide the public a sample of what there is to see, do, hear, taste, buy, and learn in Kansas. The Kansas Explorers Club inspires, educates and encourages the exploration and appreciation of Kansas...and to have fun doing it. ERV (Explorer Research Voyage) is what we called our journey to every incorporated city in Kansas (all 626) to research for the Kansas Guidebook 2 for Explorers. The 8 Wonders of Kansas contests featured the eight rural culture elements and involves the public in getting to know Kansas. 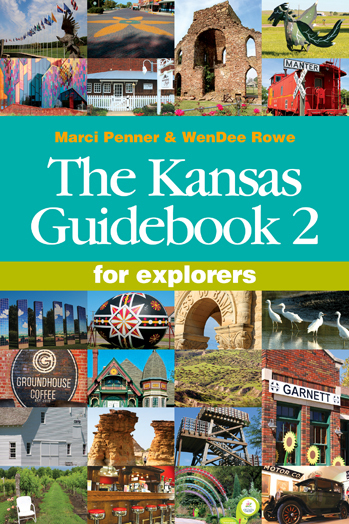 Now, you can find all 216 entries in the contests within the 8 Wonders of Kansas Guidebook. "Rural Kansas: Come and Get It" is a project to collectively promote rural communities by telling what we have and helping the world "get" us. We will begin classes after the guidebook is published. The We Kan! Network and newsletter connects rural community leaders and supporters statewide in efforts to strengthen towns at the grassroots level. The We Kan Conference helps rural communities be the best they can be at being themselves.The Big Rural Brainstorm encourages people to think big about possibilities for their communities. We Kan! awards are presented to ten recipients each year. Explorer Tourism helps communities of any size attract explorer-types. The Kansas Sampler Foundation acts as a clearinghouse of information for rural communities and often as a liaison with the media.